Stuff I have been eating lately. Breakfast is usually cereal plus goodies. 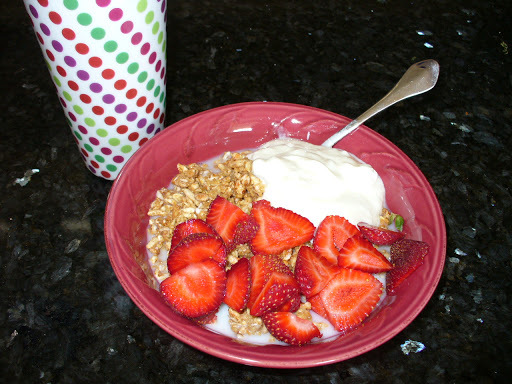 Kashi Go Lean Crunch with rice milk, lowfat plain yogurt and fruit. Strawberries, blueberries, raspberries, tayberries or peaches are most common. 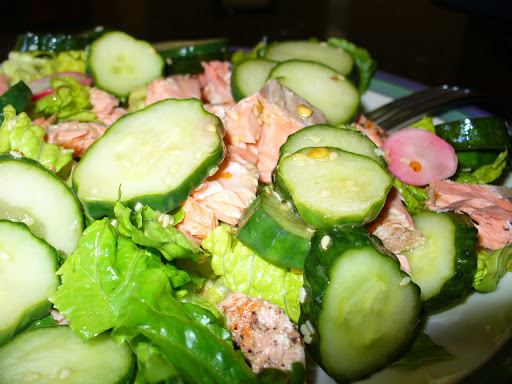 Romaine with leftover salmon and leftover Sesame Cucumber Salad on top. 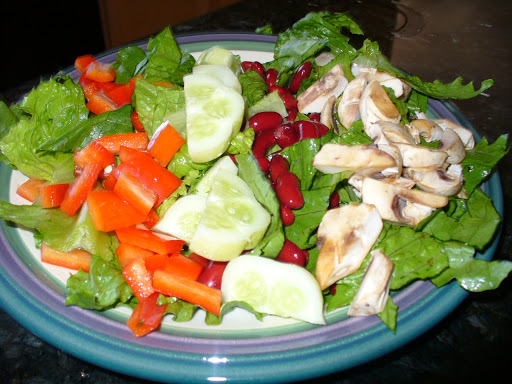 This one is romaine topped with diced red pepper, lemon cucumber, kidney beans and mushrooms. Dinners are ususally a protein, some vegs and sometimes a starch. 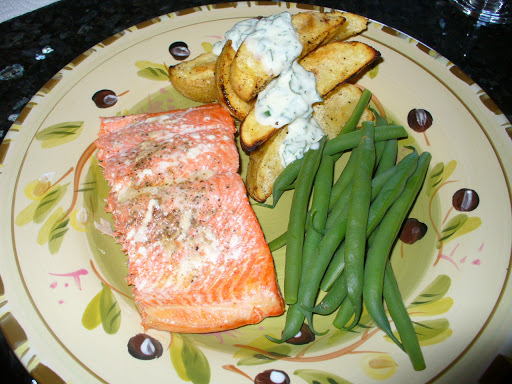 Grilled salmon, garden fresh green beans, garden fresh grilled potatoes topped with yogurt-rosemary-chive-flat leaf parsley dressing. 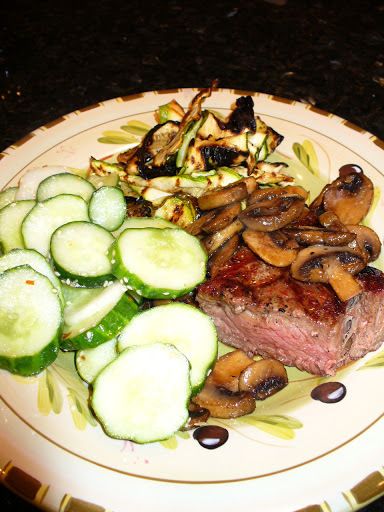 Grilled rib eye with sauteed mushrooms, Sesame Cucumber Salad (seriously-so GOOD!!) and grilled zucchini. 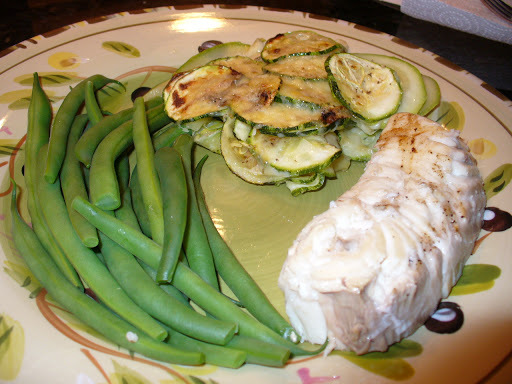 Fresh grilled halibut, garden fresh green beans and Romano Zucchini Gratin. Food doesn’t have to be complicated to be good. In fact, it is more important for food to be FRESH than for it to be complicated. Fresh, local food, prepared simply is amazingly good. The green beans are just steamed in the microwave for a few minutes. The fish and steak are lightly dressed with olive oil, salt, pepper and maybe a sprinkle of garlic powder.Simple, flavorful and fresh. 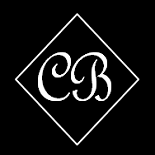 This entry was posted on August 10, 2011 by Corrie Beebe in food, garden.